At COP24 in Poland, everybody agrees that technology has a great role to play in addressing climate change. Now the question that is debated is: How can we transition to a cleaner economy, without adding an expensive and additional burden to societies? For Koen Peters, the answer is quite simple: focus on the technologies that both deliver economic benefits and fight climate change. Over 50 million metric tonnes of CO2e emissions will be avoided thanks to the solar technologies sold, to date, by our members and affiliates, over the products’ lifetime. That’s the climate equivalent of taking 12 coal-fired power plants offline for a whole year; quite staggering given the modest size and cost of these products and the nascent state of our industry. This reduction happens the moment a household switches to solar from one of its predecessor products, the dirty kerosene lamp, which emits dangerous and toxic black carbon with high climate-warming potential. An estimated 270,000 metric tonnes of black carbon is emitted from kerosene lamps worldwide each year, with a climate-warming equivalent close to 240 million metric tonnes of CO2. That roughly equates to 4.5 percent of the United States’ CO2 emissions and 12 percent of India’s. Eliminating these emissions would be equivalent to a five gigaton CO2 reduction over the next 20 years. Research shows that households that acquire off-grid solar products do this in the first place to obtain modern lighting, and then stop using kerosene. We are tackling climate change this way right now. However, we need to go further, faster. What else are we seeing in the process? Four big things for prosperity. Off-grid solar is creating opportunity across the globe, creating new jobs and growing income. Recent research in East Africa found that 36% of households using solar home systems report an immediate increase in income, on average $35 per month — more than half the average monthly GDP per capita. Almost a quarter of customers use their systems for business or income generation; 89% see this resulting in increased revenues. 11% of customers have started new enterprises, the most common being a phone charging business. Improved access to light and power unlocks previously unproductive hours. Data shows that solar home systems enable 44% of users to be more flexible with their daily activities and spend more time working and earning. In 7% of homes using a solar home system a member of the household reported being able to get a new job. Beyond enterprise, the additional hours of light created by solar products leads to more time for children to study. 84% of households with children report that the younger generation now have more time to do their homework. “We know that off-grid solar power changes lives." Solar home systems can act as a catalyst for more climate resilient and sustainable economies, getting us ever closer to the UN’s Sustainable Development Goals. Specifically, solar provides clean, vital energy to some of the world’s poorest communities; to the very communities who will be worst affected by climate change. This is already happening in many parts of the world, where solar is powering health-centers; pumping clean water; lighting schools; supporting agriculture and boosting local economies. 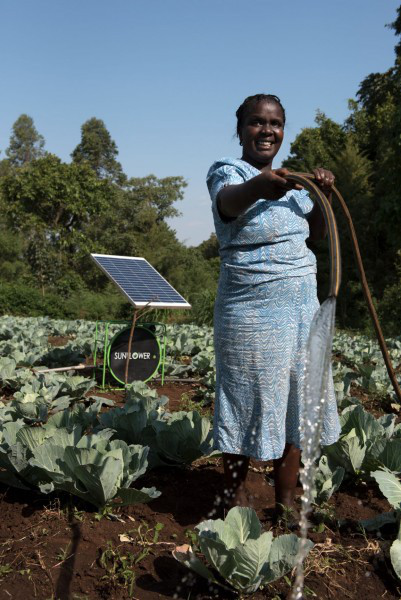 Solar allows people the means of generating a sustainable, climate-resistant income; farmers can grow crops out of season or during droughts with solar irrigation. Quite literally, solar is powering opportunity. Access to off-grid solar can bring significant improvements to health and safety. Kerosene lamps emit smoke that contains large amounts of health-damaging fine particulate matter (PM2.5). Typical PM2.5 levels in households using kerosene lamps have been found to be five times higher than the level deemed safe by the World Health Organization. Yet after replacing kerosene with solar lights, one study found that PM2.5 concentrations in rooms fell by as much as 80%, leading to a 70% reduction in the average exposure of school children. Unsurprisingly, 91% of households that previously relied on kerosene, report health improvements after buying a solar home system. 91% of households feel safer, too, after purchasing a product. For some customers, safer means a reduction in injuries from kerosene burns or falling, for others it means warding off thieves, attackers or wild animals at night. Solar absolutely can and doestackle climate change and boost prosperity simultaneously. We’ve gone beyond the point of solar power being a win-win situation; it’s a no brainer. The ‘win’ is instant too; from the moment a customer invests in solar, the impact is immediate. Better light, cleaner light, cheaper light. More light to do more. More light to earn more. As a sector, we must take this technology as far as we can, as fast as we can. For the sake of the planet and for the one billion people still living with little or no access to electricity, and who will be the hardest hit by the affects climate change. So together, let’s make this transition happen now. It is our time. A message from our friends at Solar Sister.